Q&A With Internet Star "Misery Bear"
The UK's fuzziest misanthrope has become an Internet sensation through a series of online BBC short films. He was in Los Angeles this week, and took time out from his vacation to talk to NBCLA.com. A depressed teddy bear with a drinking problem and suicidal tendencies has become an online hit thanks to BBC Comedy. "Misery Bear" focuses on a British teddy bear trying to get through life, work, love and in one case, a zombie attack. Even a simple holiday in London ends with the titular character in a hospital bed. Poor, Misery Bear. Although the dark comedy has yet to really catch fire in America, his videos have garnered millions of hits worldwide, and his official Facebook page tops 27,000 fans. It's only a matter of time before Misery Bear fandom reaches the states. 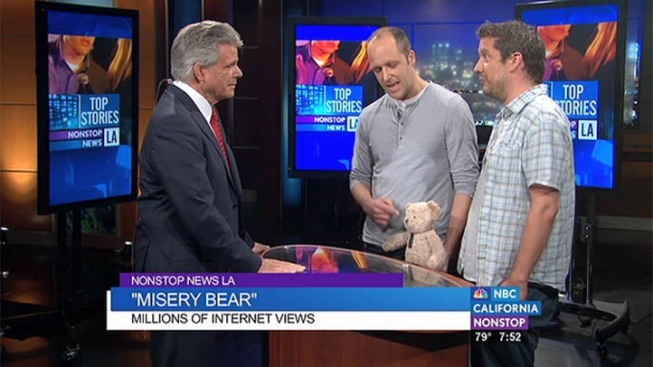 The creators of "Misery Bear," Nat Saunders and Chris Hayward, appeared on "Nonstop News LA" Wednesday (video embedded, above). NBCLA.com: Welcome to Los Angeles. What's been the best part of your trip? What brought you to town? Misery Bear: Hello. Thank you for having me. I wasn't sure I was going to be allowed in. The guy at the airport threatened to unstitch me and look in my tummy. The best part of my trip? Well, I've been to three pool parties, a lady in a bikini kissed me, I ate the biggest omelette I ever saw in my life, and the beer here is cheaper than in London. On the minus side, I drank too many beers last night and woke up in a carpark on Sunset. I'm in town for business and pleasure. Meetings, pitches, that kinda stuff. And I want to get a tan. NBCLA.com: What has been your favorite Misery Bear video so far, and why? Misery Bear: Well, shooting with Kate Moss was pretty good fun, even if she was a bit obsessive. Most of the videos I can't watch because they remind me of my terrible life and all the horrible things that have happened in it. I kinda wish we could stop making these films. They're crushing me. NBCLA.com: Misery Bear has a way of connecting with viewers. What's made him so relatable? Misery Bear: They tell me you humans see your own sad, troubled lives in mine. When you see me get stood up on a date, or trying to occupy myself on a lonely day, you feel better cause you realise you're not the only one that kinda stuff happens to. Also, I'm apparently quite "cute," although I personally find that description demeaning. NBCLA.com: Los Angeles is a long way from Misery Bear's home turf in the UK. Do Angelenos recognize MB, or do you get strange looks when posing with LA landmarks? Misery Bear: I've had a few strange looks, yes. One guy asked me for my autograph, but I think he thought I was Paddington Bear. I guess I haven't "broken" America yet, although I do have lots of US pals on Twitter and Facebook. Hello guys! NBCLA.com: What's MB's favorite bar in LA, and why? Misery Bear: Well, I've been hanging at the Skybar in the Mondrian hotel (pictured, above) quite a lot, because the pretty people by the pool are nice to look at. My favorite waitress, Lauren, brings me free drinks too. I think she likes me. NBCLA.com: You've said Misery Bear is part autobiographical and part exaggeration. Tell us about the autobiographical aspect -- how does the character reflect its creators? Misery Bear: Well, the guys that shoot my films -- Nat and Chris -- are losers, for sure, but they're not loveable losers like me; they're just idiots. They like to take the credit for coming up with the ideas in my films, but it's all stuff that happened to me, not them. Grrrrrr. Just thinking about them is making me angry. I wish I could roar. NBCLA.com: Misery Bear was recently featured in an anti-torture campaign with Amnesty TV. 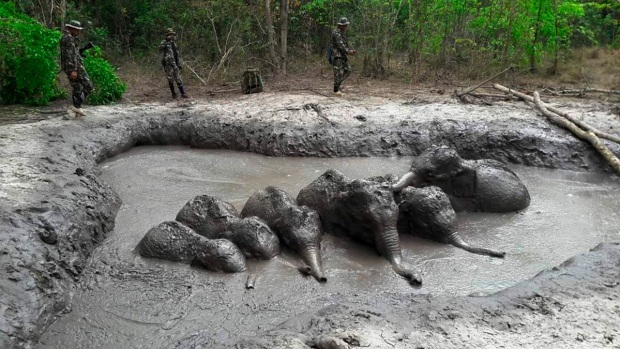 Will we see Misery Bear becoming more involved with campaigns like Amnesty? What does MB's political future hold? Misery Bear: Well, despite finding you humans very annoying and mean at times, I don't believe you should be allowed to torture each other, so I was happy to lend my services to Amnesty to make that point. I do a lot of work with Comic Relief to raise money for poor and starving people, too. See? Even though humans treat me like crap I still try and help you out. Politically, I would like to rule a country. There are some pro-bear laws I'd very much like to see passed. NBCLA.com: When does "Misery Bear's Guide to Love & Heartbreak" come out, and what can readers expect in MB's debut book? Misery Bear: It comes out in October but you can pre-order it on places like Amazon already. I wrote it in the spring, and it's full of my stories, poems, dating advice, photographs, drawings, love letters, diary entries and lots more. I think it might be one of the greatest books of all time. I'm really hoping for a Pulitzer. NBCLA.com: Misery Bear somehow survived a run-in with Kate Moss. Can we expect more celeb cameos in future MB videos? Misery Bear: I sure hope so. I'm thinking Anne Hathaway? Or maybe Beyoncé? Maybe both of them in the same film. "Misery Bear's Best Ever Day." I'd watch it. NBCLA.com: Tell us something about Misery Bear fans may be surprised to learn. Misery Bear: I wear contact lenses.